A League of Their Own has done some many remarkable things. First and foremost, it has ensured that a small part of baseball history is never forgotten. Second, it captures the spirit of both its time setting and the time of its release. Third, the film hits all the emotional marks, making this a film about baseball, about gender roles, and a film about people in their humor and heartbreak. World War II is taking all the Major League Baseball greats. Fearing that America's pastime might slip into obscurity or worse, fold entirely, owners seize on an original idea: let women play professional baseball (at least until the men return)! Scout Ernie Capadino (Jon Lovitz) is sent to find the talent to form the All-American Girls Professional Baseball League (AAGPBL for short). He is highly interested in Dottie Hinson (Geena Davis), a catcher he spots in Oregon. Dottie isn't interested in playing professional anything, satisfied in her life and waiting for her husband to come back from the war. Her younger sister Kit (Lori Petty) on the other hand, yearns to get out of the farm and wants desperately to join. After some arm-twisting on Kit's part, Dottie reluctantly agrees to the tryouts. On their way, they pick up a phenomenal player, Marla Hooch (Megan Cavanagh), whom Ernie at first does not want to get because of her unattractiveness but who is forced to when both Dottie and Kit refuse to go without her. At the tryouts, they encounter several other women of various social backgrounds, from a Southern belle and a (secretly) illiterate player to a couple of brash Nuw Yawkers, "All the Way" Mae Mordabito (Madonna) and her bosom buddy, bouncer Doris Murphy (Rosie O'Donnell). I'll leave it up to you to figure out why her nickname is "All the Way" (here's a hint: I don't think it was her homerun skills, though I'm sure she managed to round the bases and was an expert in Grand Slams). Dottie isn't intimated by them and they find themselves members of the Rockford Peaches. Heading up the team is crusty, boozed-up, washed-up manager Jimmy Dugan (Tom Hanks), a former Cubs legend who is disdainful of both the idea of 'girls' playing professional baseball and of his career not what it was once before. However, as time goes on, he starts seeing the genuine talent of the players, who show their skill, start bonding, and respecting each other. Dottie and Kit, however, are starting to struggle with each other, one attempting to dominate and the other chafing to be free. Kit is shifted to a rival team, and as things work out, they face each other in the championship. In the end, the sisters do reconcile and now, going back to the beginning (as the film is an extended flashback), the various surviving players reunite at the Baseball Hall of Fame, which is having a special exhibition on the AAGPBL. Dottie sees a display for Dugan and pauses, the impact of all she's lived through hitting her. Still, this is a happy time despite the loss of others who shared the journey, for it is a reunion, and the real-life players take to the field one more time. I'm pretty sure until A League of Their Own premiered, few people, even baseball aficionados, were aware of the short history of female professional baseball. It was a pretty much forgotten story, until director Penny Marshall with screenwriters Lowell Ganz and Babaloo Mandel (with the story by Kim Wilson and Kelly Candaele) brought what could have been a stuffy history lesson or a lecturing 'women are equal to men' scenario and put things together remarkably well. The first is that the film makes its case for the equality of women without making us feel as if we are being force-fed the idea. Instead, A League of Their Own made the wise choice of having us invest in the characters as individuals, particularly when we see the women playing ball so well. It also reminds us of how women at the time were perceived when we get a sequence of the 'girls' having to undergo charm school. With the dichotomy of seeing them as both women and as professional baseball players, the film keeps the balance where one aspect doesn't overshadow the other. As I said, the film gives us a wide variety of personalities to work with, and as such, we see them as these complex people, who work at sports but who have extra burdens. It is simply impossible not to have all the appropriate reactions: whether it's the comedy of the famous "There's no crying in baseball!" line or the tragedy of one of the players finding out her husband has been killed in action. 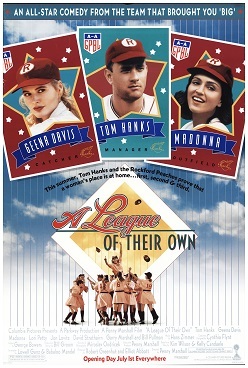 In terms of performances, I think A League of Their Own is a showcase of veritable talent. Geena Davis, to my mind, has simply never been better as the strong, assertive, no-nonsense Dottie. Hanks owns every scene and always manages to make each scene he's in exactly as how it's suppose to be without overdoing it (be it the comic or dramatic side). Even Madonna, who has had a hit-and-miss career in film (from the heights of Desperately Seeking Susan or Evita to the dredge of Body of Evidence or Swept Away) makes Mae into a brassy, tough, but also loveable and endearing girl who loves to dance and have a good time (a bit naughty but never horrid). I will confess one thing about A League of Their Own that I am not sure about. Did Dottie really literally 'drop the ball' or not? I found myself at the end of A League of Their Own totally enraptured by its story, so much so that I'm not ashamed to admit I shed a few tears at the end. Thanks to A League of Their Own, the expression "you throw like a girl" can serve as a compliment.